I thought this was an impressive and original debut novel and it is nice to see a fresh take on the space opera genre. It does have a great premise, the idea of the avatar of a ship’s AI trying to survive and find revenge for the destruction of its ship is a fascinating idea and one I’ve not seen done before. 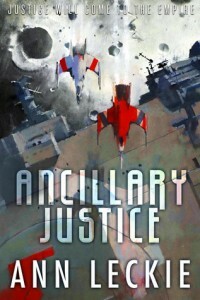 Alternate chapters show the main character before and after the destruction of the Justice of Toren and it does provide a fascinating contrast between being one part of a great collective intelligence formed from the ship and its army of avatars and a single surviving avatar on its own. At the beginning of the novel it’s not entirely clear what is going on but both timeframes gradually provide revelations about what happened, this is effective in making the past timeframe more compelling as it is clear there is an impending disaster even when in the middle of what should be a straightforward peacekeeping mission. One of the strengths of the writing is that while it is told from an alien viewpoint it still manages to make it possible to relate to the main character even if they’re not particularly sympathetic – they are working for a brutal interstellar regime that fights endless wars of conquest and use captured prisoners as hosts for their ship’s avatars. One of the main themes is the effects of a having a single intelligence split among many individual bodies and how small differences between those individuals can have significant effects. Another unusual feature of the viewpoint is that the lead character comes from a civilisation that doesn’t distinguish between different genders so throughout the book they refer to everyone as ‘she’ or ‘her’. This is a bit disorienting both for the lead character as they try not to offend anyone while in a civilisation where gender is significant and for the reader. I found that I was subconsciously deciding that different characters were either male or female even though the book didn’t seem to be stating which character was which. It could have easily felt like a gimmick, but I think it works due to showing things from the protagonist’s perspective and making it believable that from their perspective whether someone was male or female was irrelevant. I think one drawback of the book being told from the perspective of a ship’s avatar is that they don’t necessarily have a good understanding of some of the other characters and so some of them also remain enigmatic to the reader. I think while there are several interesting characters it does perhaps suffer slightly from a lack of genuinely likeable characters since it can be hard to care about the fate of most of them, with the exception of Lieutenant Awn. In many ways the book is a bit reminiscent of Iain M. Banks’ writing, which is no bad thing although even in his darker stories I think Banks would still have managed to inject a bit more fun into it. The book is fast-moving but it does feel a bit rushed towards the end and also incomplete as this is clearly only the first book of a series. While the ending does resolve some matters and it does unravel the central mystery of the book, I think it is too inconclusive for the book to really stand on its own. This is a strong debut novel and the start of what should be a good series. There are a few flaws and the ending felt a bit weak compared to the rest of the book, but it’s still a good beginning.